The baby bunnies have survived! I’ve been checking the nest daily, using a twig to move the grassy covering, and being very careful not to touch any of the babies. After re-covering the nest, I throw the twig into another area of the yard so that my scent isn’t obvious. Sure, the bunnies know there are humans about and probably can tell we’ve been close to the nest, but Mama Bunny seems to be ok with that so long as the babies aren’t handled. They’re getting big. It’s only a matter of time before they’re off and running. And then Puppy Cody will be in her glory. She can chase them, but baby bunnies are faster than she is and are able to squeeze under the fence to get away. This entry was posted in Pets, That's Life and tagged baby animals, baby bunnies, bunnies, bunny, bunny nest, Cody, nature, Puppy Cody. Bookmark the permalink. 24 Responses to They’re Alive! Yay! Glad to know the bunnies made it. Happy Friday! Thank you, and thanks for coming over to read my post. 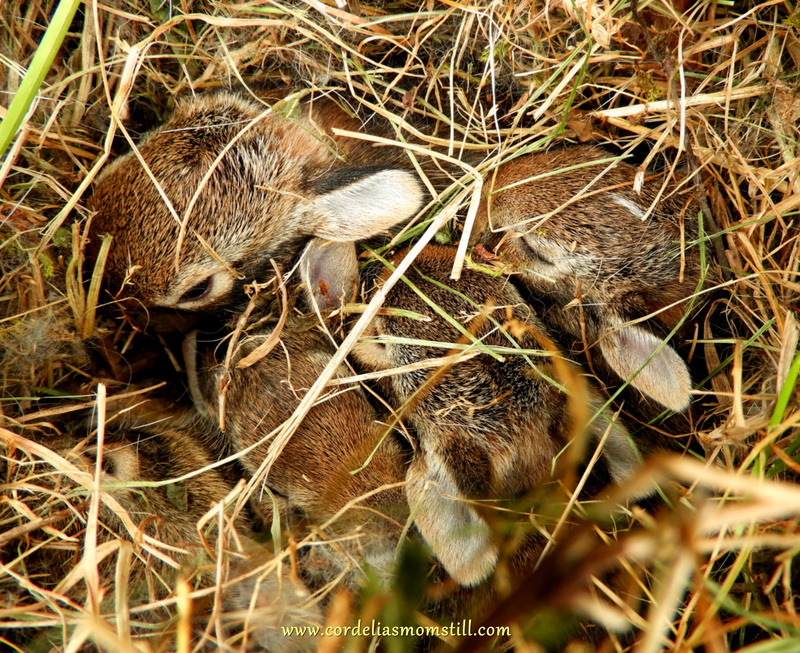 I was especially happy to see that the mother bunny hadn’t abandoned the nest. I was so afraid she would after Cody ate one of her babies last week. They are all ears. It’s so hard to resist the temptation to just pick one up. I’m glad they made it this far – I hope they start running around soon. I’m sure they will. I just hope they run really fast. I’ll do my best. I always look out and check the yard before opening that door. Aren’t they the cutest. My rabbits have protection by having their babies under the shed and or under the deck in the back. Then when they are big enough they come out and the race is on. I have never EVER seen my dogs win! But they sure get a good run in. Running rabbits are safe from Cody. The problem was that the babies couldn’t run yet last week – in fact, they were newborn and still had the birth sac. I was so afraid the mama would abandon them. 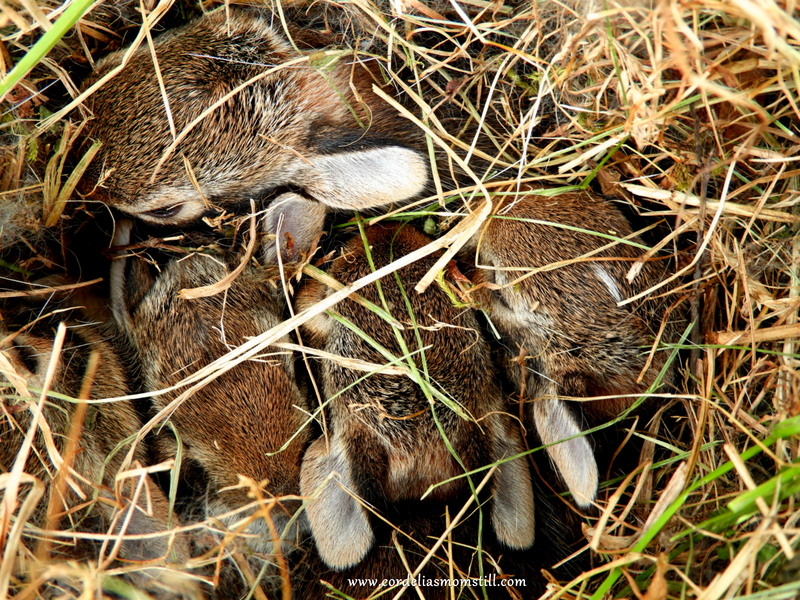 Hooray for baby bunnies who can escape doggy instincts, CM. I think it was the mama who had the instinct to build her nest close to the garage and where she probably new the humans would try to protect it as much as possible. They are, aren’t they? Wish I could pick them up, but I can’t. Yes, and Cody wants so badly to “play” with them. I’m so glad the bunnies are alive! Me, too. I hate it when little critters don’t survive. Shouldn’t be too much of a problem for me. My flowers are in front of the house and the bunnies are in the back. My loony neighbor’s flowers are along my back property line, so I think the bunnies will eat her flowers before they walk around my house to get to mine. There was a mama and young bunny out there this morning. I think a different litter. Cody tried to catch them, and couldn’t. Those babies are simply too fast for her.